Olomana is one of the more popular hikes on Oahu, but not because it’s an easy hike for all to enjoy. It isn’t the highest peak or longest distance by any stretch. Rather, Olomana consists of some of the most steep, narrow, and precarious ridges, and the thrill of risk is what drives so many to hike it. 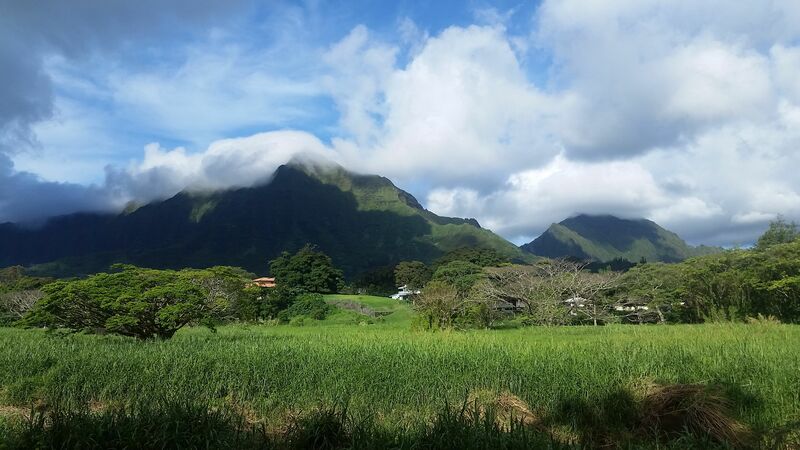 Located on the Windward side of Oahu, Olomana stands prominently all on its own, jutting straight up from the surrounding flat ground at 1,634 feet. 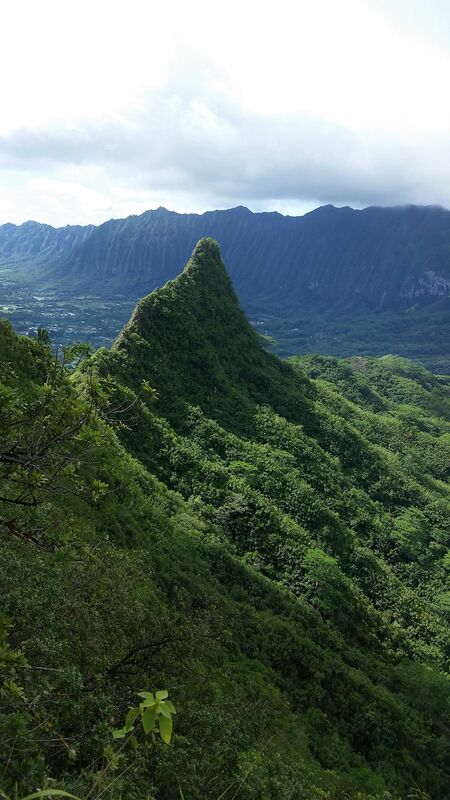 It is also commonly referred to as “Three Peaks Hike” because it has 3 distinct peaks: Olomana, the first and highest, then Paku’i and Ahiki which are lower but much more challenging and dangerous to reach. Unfortunately, there have been many fatalities while hiking between these peaks, several within the last decade with the latest being last month. We’ve admired Olomana from all different sides, from the ground below and the Ko’olau Ridge above. 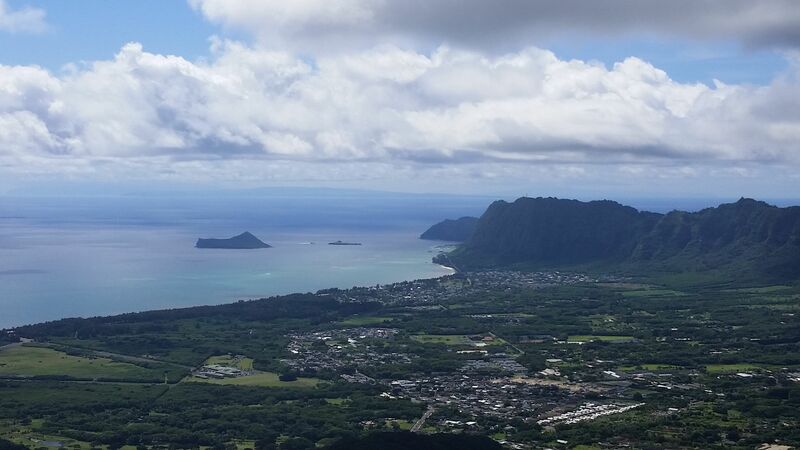 While I haven’t felt any desire to complete the “3 Peaks Challenge,” I couldn’t deny the urge to climb up to the first to see the Ko’olau ridge and Windward Oahu from a new perspective. It had been a while since we had hiked up any steep ridges using ropes so I wasn’t sure I was ready to take on this one, but when we set out eager to hike one weekend morning and saw that the Ko’olau Ridge was engulfed by clouds, we altered our plans to hike Olomana instead. It hadn’t rained for a few days so the trail would be drier and safer, and the peak would give us more impressive views of the cloud-covered Ko’olaus. I forgot my camera, but it was probably for the better today. Enjoy my low-quality unedited cell phone pictures! This was the view along the golf course road while walking to the trailhead. We parked outside the golf course and walked along the road to reach the official trailhead. The trail to the first peak (Olomana Peak) is only 1.3 miles, but the hike was a mile extra each way from where we parked. The trail begins by following a stream and was quite muddy that day, but thankfully that wasn’t the case for the steeper part. The first half mile gradually gains some elevation (around 330 feet), making its way around to the steep ridge. The .8 miles from there to Olomana peak are where the real fun takes place — gaining nearly 1000 feet, going straight up the steep ridge. If you’re interested in seeing the contour lines and map from this impressive hike, visit the AllTrails listing. Beginning the climb up the biggest obstacle. We stopped for breaks here and there to catch the few views between the trees. 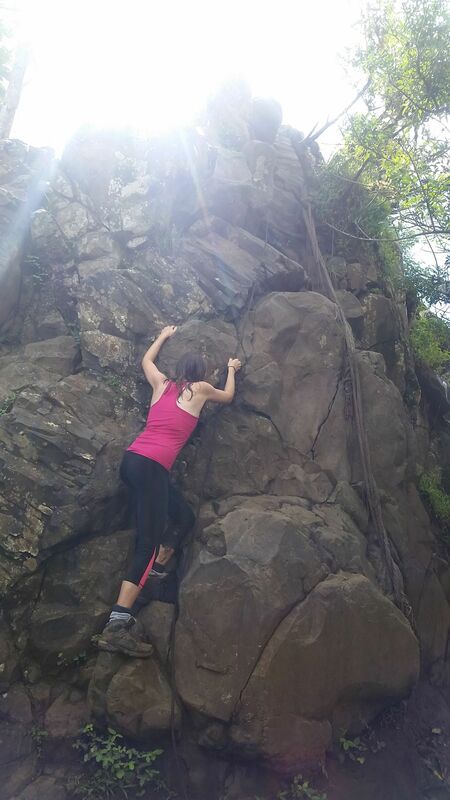 We finally made it to the giant boulder, the biggest obstacle yet on the trail. There were several ropes for support, and I made it up without hardly any verbal instruction from Curtis. I was so proud of myself. I thought the worst was over, with the remainder of the trail just being an incredibly narrow walk to the peak. The incredibly narrow ridge up to the third peak. It took Curtis literally pushing me up to get me to finish the trail, and once secure on that relatively tiny rock with a steep drop off from either side, I stopped to calm down and catch my breath before finishing the trail. Yeah, there was no way I was doing the second or third peaks. While I was standing there, with Curtis trying to convince me we were about done, we heard the loud blades of a helicopter. We turned around and watched as he flew down below us, around the foothills, then back up the other side. He was right at our level when he passed by, close enough where we made eye contact and waved. It was a search and rescue helicopter, I assume just practicing making the rounds. It was just a brief encounter that took my mind off the stress and encouraged me to finish the hike. The views from the top of Olomana were exactly what we had wanted. 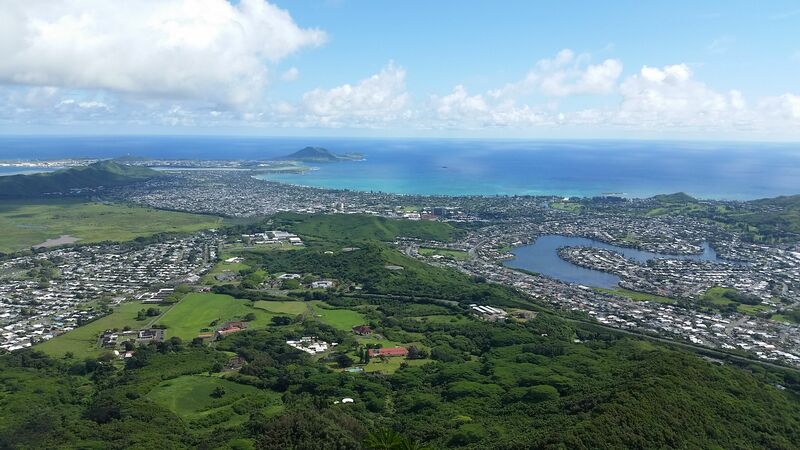 Since we were on the highest peak, we had excellent 360 views of the Ko’olau Ridge and the Windward side of Oahu, including our home somewhere down there. It was such a clear day that we were also able to see Molokai and Maui in the distance. From our high perch, we also enjoyed closer views of the second and third peaks. They were further away and much lower than I had expected. This mountain has always fascinated me, as the views from each direction come across differently. From some angles, the 3 peaks sometimes appear closer, farther apart, higher, or steeper than they actually are. Now having seen them from this angle, they still fascinate me just as much. Not in the “I want to hike all of them” way, it just brings out my appreciation for the unique beauty and wonder of God’s creation. Facing Makapu’u and the Southeast side of Oahu, with Molokai and Maui in the distance. We sat there in the sunshine, eating snacks and enjoying the view, and mentally preparing ourselves for the hike back. Going up is physically strenuous, but going down is technical and dangerous. For whatever reason, going down the last bit that had been the most challenging for me while hiking up wasn’t quite as difficult this time. I took it from a slightly different approach and made it down safely. The only part I needed help from Curtis was when descending the large boulder. He went ahead of me and told me where to put my feet so I wouldn’t have to look down, and I greatly appreciate him for that. After that, I was able to descend all the other rope sections on my own and without instruction — I’m improving! Once passed all the ropes, the rest of our hike went by quickly. One more exciting hike checked off our list!